Here’s what you need, for 4 portions. These pictures are for two portions, so just double what you see! 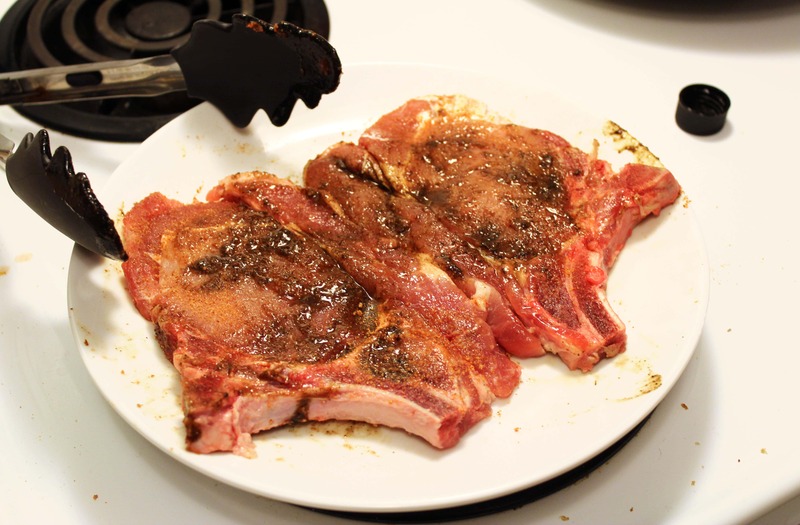 4 pork chops, bone in or removed – whatever is cheapest! 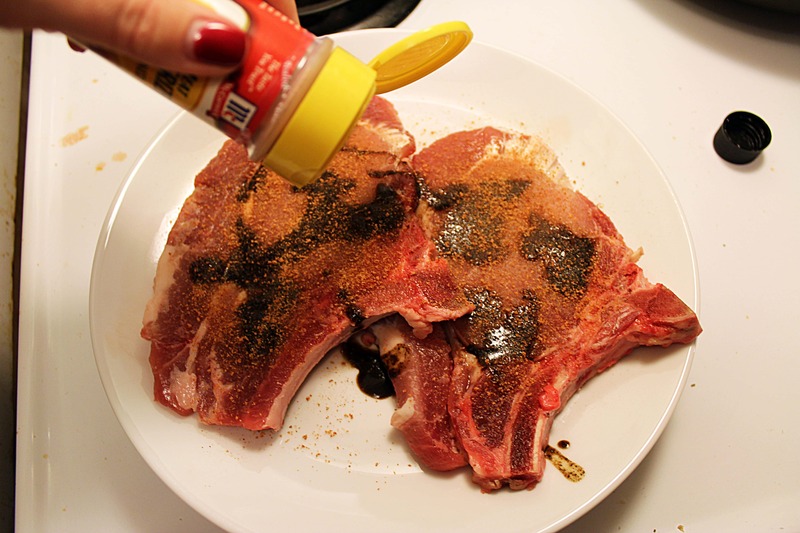 First, get the seasonings on your pork chops. Mine are nice bone-in dudes that I found on sale, but any kind of pork you find is great! Clearly, you could also make this recipe with chicken if that’s all you have or you’re not into pork. Try not to freak out too much. 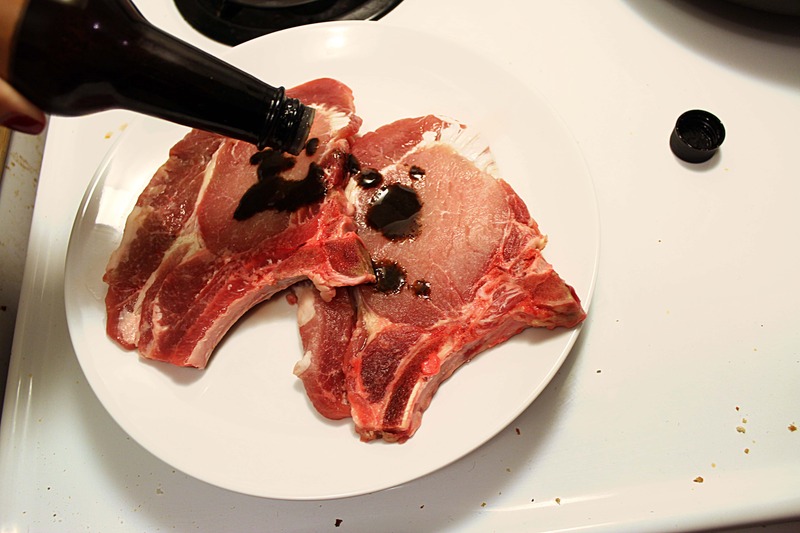 Add a few drops of Worcestershire sauce to the pork, then sprinkle on some meat tenderizer. And season the other side exactly the same way! Now, let these guys hang out while you start the sauce. If you think to do this way before you cook, great. If not, that’s fine too! Don’t freak out. 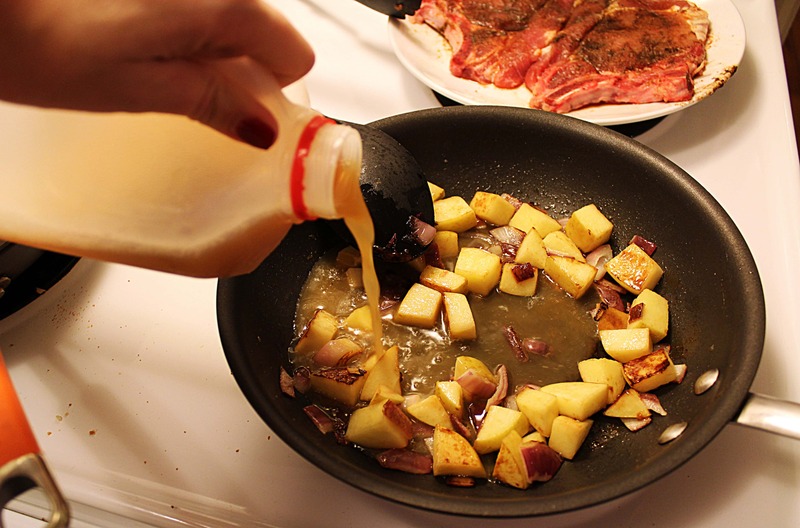 Grab apple, onion, and butter for the sauce, and chop the apple and onion into chunks – not too small, I like a chunky sauce. Nice! 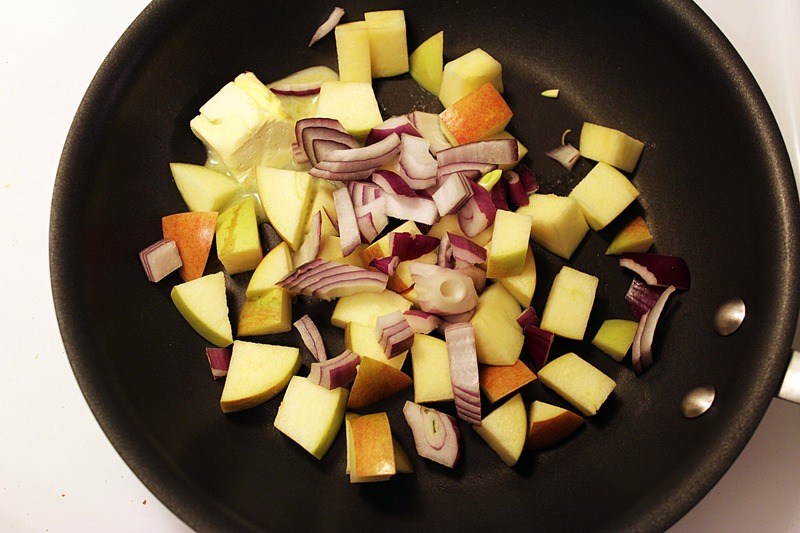 Now, heat a pan to medium heat and add a pat of butter with the apple and onion, and a sprinkle of salt and pepper. 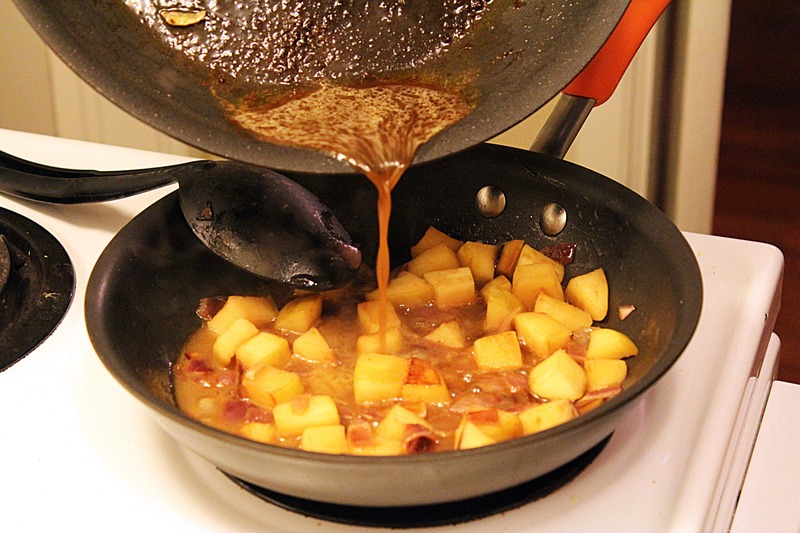 Stir the cider into the apple mixture and let it simmer to reduce. 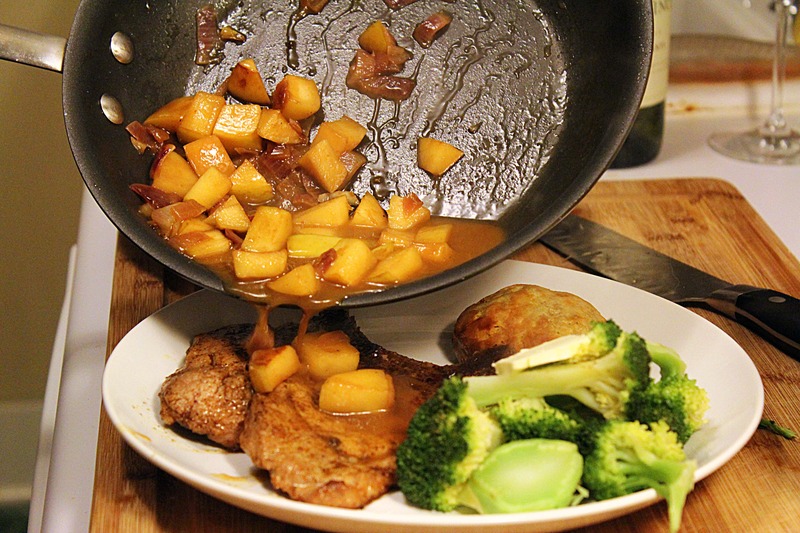 While the apples and onions are cooking, let’s get back to the chops! 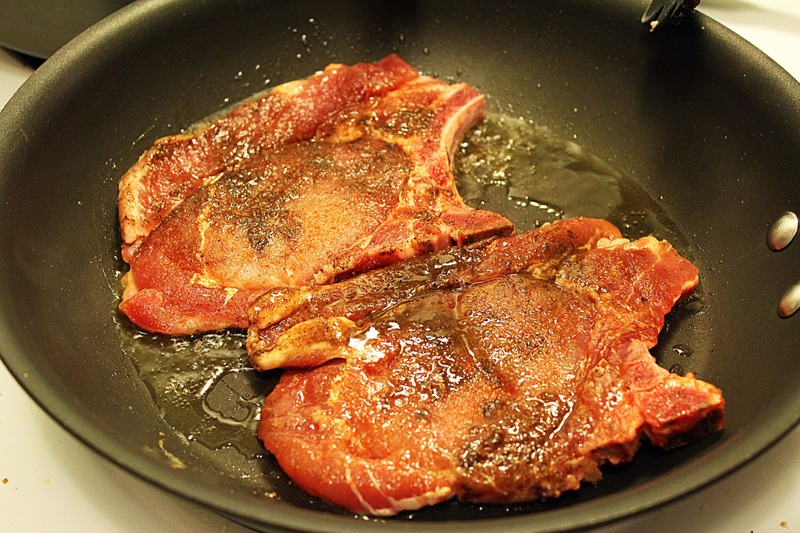 Heat a separate pan to medium-high heat and let it heat up for a long time so the pork chops will be super duper crispy. 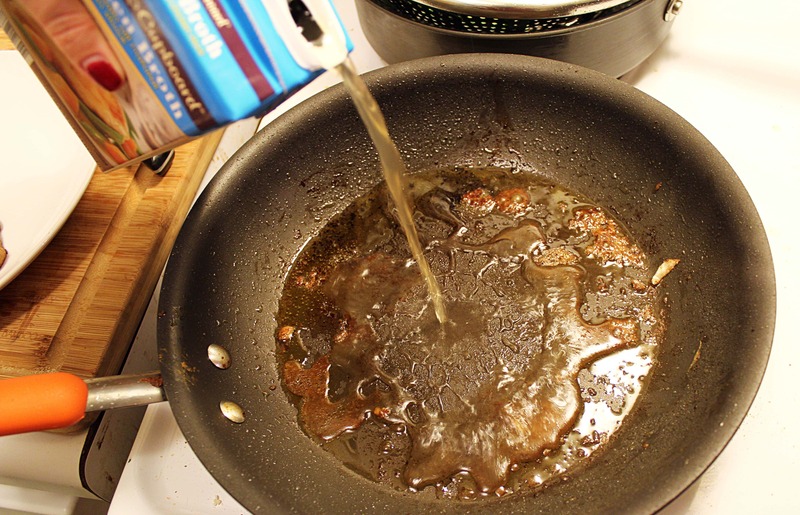 Then, add the chops with a drizzle of olive oil to the pan. 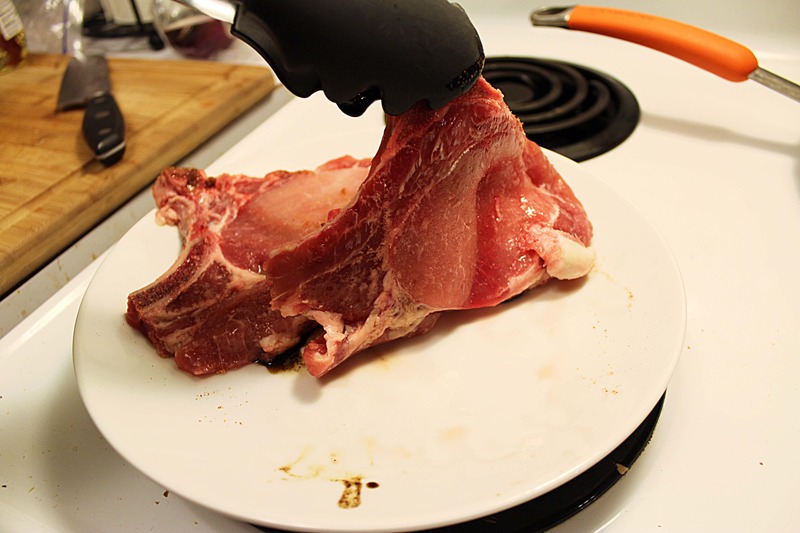 Don’t mess with the chops once you’ve started them! Let them sizzle and cook for at least 5 minutes until you can start to see whites around the edges. How long you cook these bad boys for will depend on how hot your pan is and how thick your meat is, so you’ll have to watch them! 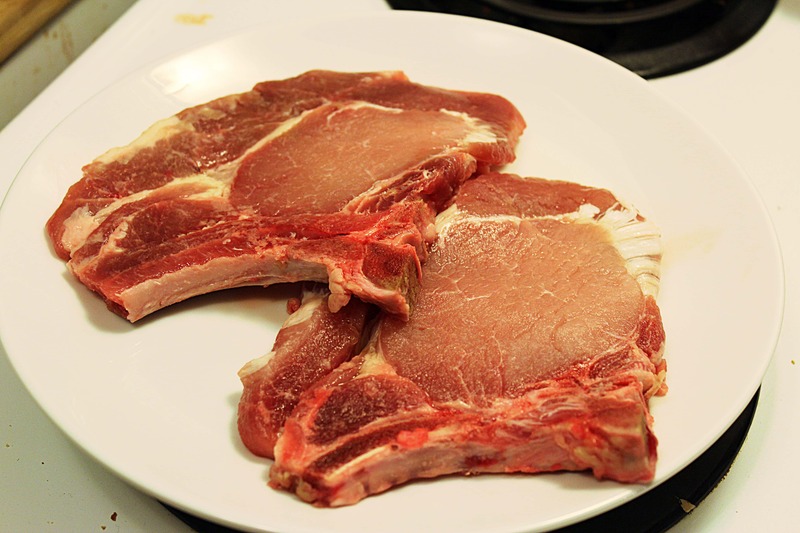 I’d say for 3/4 inch chops with the bone in you’ll cook for 7 minutes or so on each side. 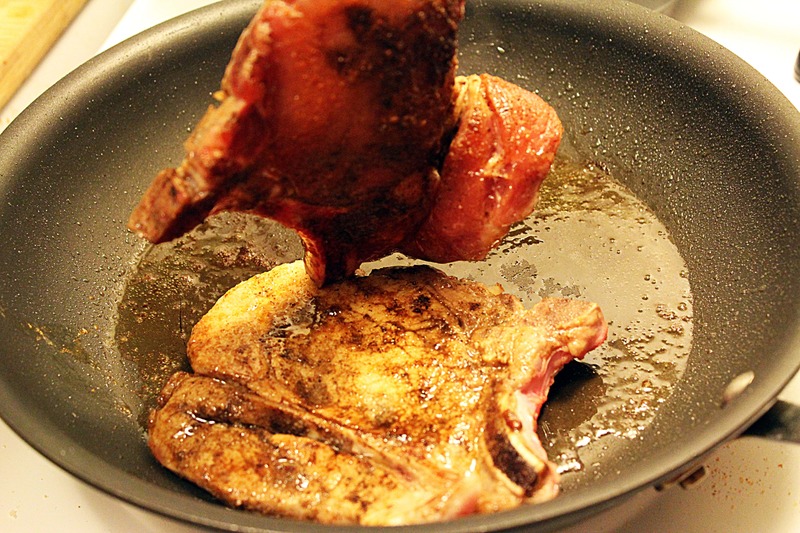 Flip the chops over and cook side 2 in the same way. 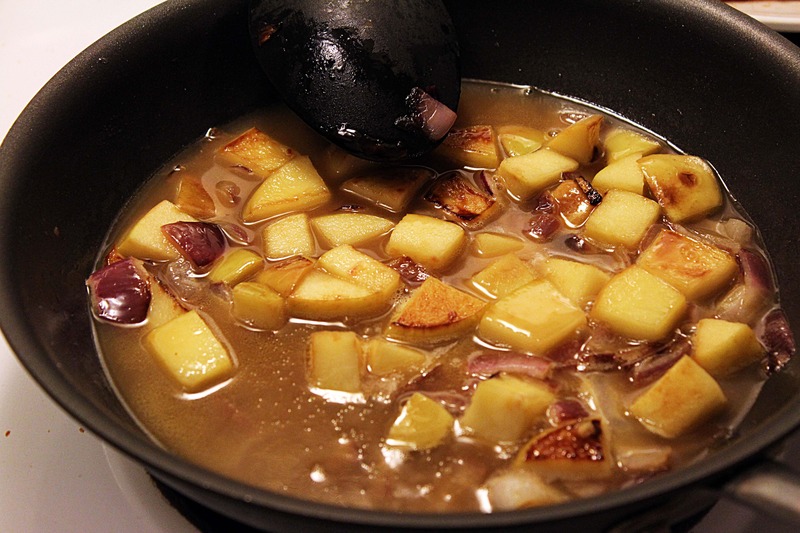 By now the apple cider should have reduced and thickened in the apple mixture. Check it out! mmmmmm yes. 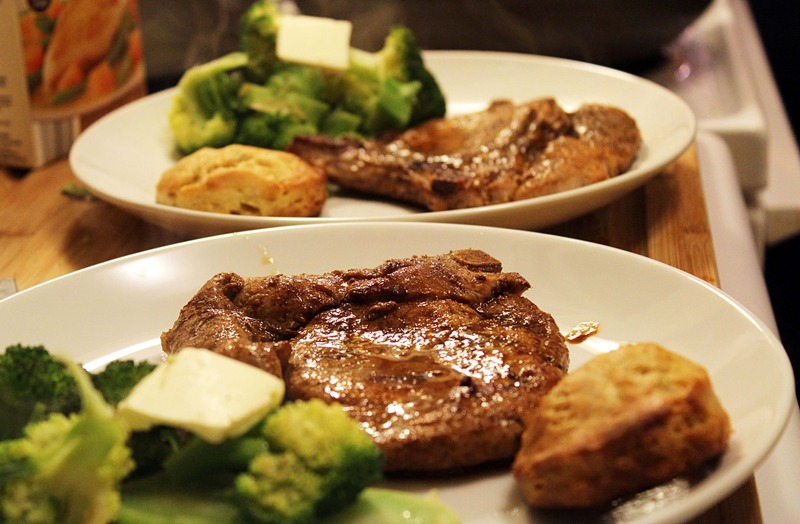 Now, when the pork chops are cooked through remove them to whatever you’re serving them on with any side dishes. 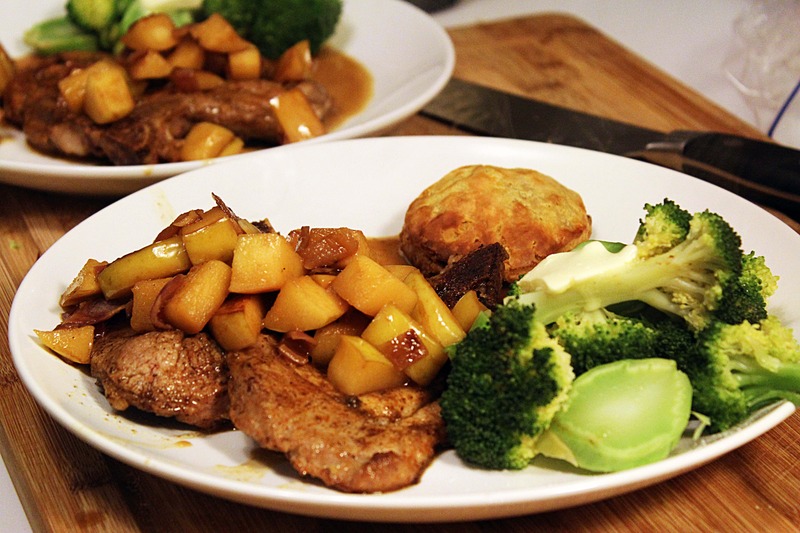 I served these with plain steamed broccoli and a biscuit – I wanted nothing to detract from the pork and gravy! Now, to the still-hot pork pan, add the chicken stock and swirl it around to get all the yummy pork flavor from the bottom of the pan. Yum. 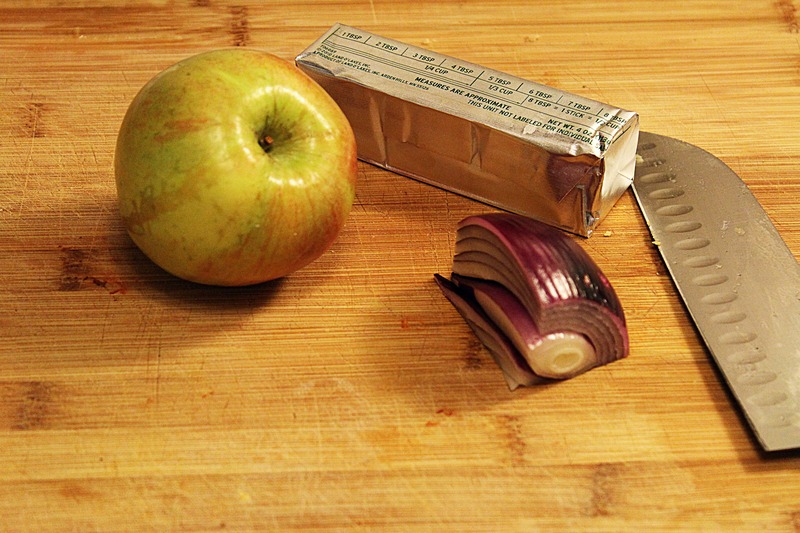 Now, add the chicken stock to the apples and onions mixture. Perfect. 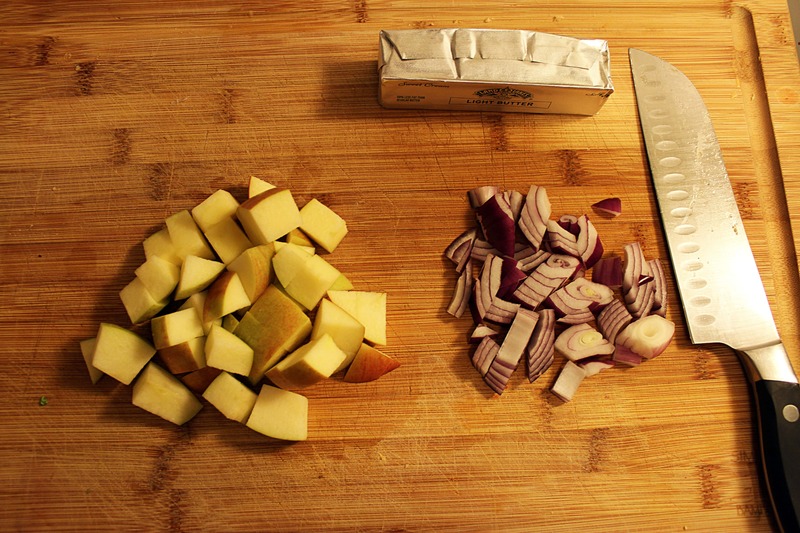 Let this combine for one more minute, then pour apples, onions, and gravy over each of the pork chops. …..and eat. That is all.